You may recall this bizarre incident that occurred last month in Venezuela. A rogue police officer by the name of Oscar Perez, who is also well known in Venezuela for starring in several B-rated action movies, commandeered a helicopter, before dropping grenades on the nation’s Supreme Court building and strafing the Interior Ministry with gunfire. It was without a doubt, the strangest moment to come out of that nation’s ongoing civil unrest. But this brazen attack isn’t just odd. In fact, it may portend something much more serious that is simmering under the surface of Venezuela’s slow motion social collapse. It’s a sign that Venezuela is very close to erupting into a full-blown civil war. Recently, a stolen police helicopter attacked the Venezuelan Supreme Court with grenades and automatic weapons. While no one was hurt, the incident should serve as a wake-up call for the entire Western Hemisphere, including the United States. The attack demonstrates a quantum escalation of the hunger-fueled conflict that has consumed the country for close to a year. Hunger is the key word. Hunger is the most basic of human suffering. Remember that rising food prices helped fuel the Arab Spring, which has left the world with a chaotic, fractured, refugee-hemorrhaging Middle East. Obviously, the lack of food in Venezuela is a key factor in that nation’s unrest. Multiple studies have shown in the past that when food prices escalate to a certain point, riots and revolutions become very likely, even in cases where the population isn’t specifically revolting over the price of food. But in any case the lack of food, skyrocketing crime, rampant corruption, and flippant tyranny that are all fueling the unrest, and giving people like Oscar Perez lots of support in both high and low places. 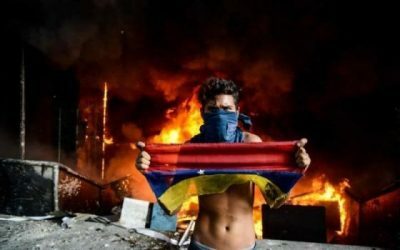 Is Venezuela in danger of becoming another Syria? Maybe. The helicopter pilot, Oscar Perez, posted a bare-faced declaration online describing himself as representative of a group of “nationalists, patriots, and institutionalists.” The fact that he has been allowed to slip quietly back into the shadows illustrates how much of the population is willing to hide him. Even more distressing is the fact that his group even had access to a helicopter, a fact illustrating how much support they may have within Venezuela’s government institutions. We can deduce from Perez’s attack that there are battle lines being drawn in Venezuela right now, and those lines run right through the middle of the civilian population, the military, the police, and the political class (and yes, that line does run through the middle of society, because there are still millions of people who support President Maduro). And that’s what makes civil wars possible. They don’t usually occur in countries where millions of unarmed civilians hate the government, and the government is staffed by plenty of loyalists. These wars tend to happen in places where the soldiers and cops are also divided along partisan lines. That way, you have a lot of people armed to the teeth with the best weapons government tax dollars can buy, and those people become two separate armed camps with divergent views and political goals.